2019: What are your motoring plans? Discussion in 'Motors' started by Gibbo, Dec 20, 2018.
run the E90 into the ground the thing just wont break, then buy a jag. Hopefully get some more entertaining driving in my Golf GTI. Between work trips and London driving (20mph zone fun) I feel I haven't had a real chance to enjoy it yet. My other plan is to get the issues with my 300zx sorted. Spent lots last year, but I think the rain has caused a few dashboard lights to come on. Also replacing the speakers and headunit. Can't make my mind up on replacing the R8. I am in a place where I can buy something like a 570S, AMG GT-R, 991 GT3 (720 and Performante still more than I am wiling to spend) but for some reason I can't motivate myself to do it. Friends are telling me to give it another year, see where the market is at because frankly I am pretty much at the bottom of the depreciation curve on the R8 and it's still a great car, which it is. £3600 fitted, with the active valve option (so it does not give me ear aids). I am going to the 720 Spider launch in March so will be 'exposed' to the McLaren stuff all over again and suspect I will, finally push the button on a 570S or even 720 if pants are dropped like I am hearing. £110K was the highest bid last week on a fair 720 at auction...not sure if it was sold at that and I know of 570's around 90K now. No doesn’t need more horses really. Yes you've lost on the R8, I've lost on the SVR, that is the nature of these cars, you spend big, expect to lose more. But on the flip side what you looking at has also come down. A year ago your R8 would of fetched what 70k, but a 570S was 120k, now your R8 will bring 55-60k, but you will get into a 570S for under 100k, so if you put man maths into full effect your actually 5-10k better off. Your thinking of modding the R8 because you want some fresh excitement and though mods can indeed help, particular more noise when you want it, nothing compared to a totally different car to adjust your senses too. Find a few nice 570S, plenty for sale and drop in some bids of 90-100k depending on spec, see if any bite. I am gonna sell the SVR and sit on the cash for a month or two if I can hold out to see what the market or brings or to see if a real nice car comes along. Off to Ferrari Saturday to test drive a 458. I've also got rent sorted on both a 458 for 24hr with 200 miles and a 570S for 24hr with 200 miles, got the pair for £1100 which was a bargain, shame they don't have a Huracan, have found a Huracan but its £800 for just 24hr and 100 miles, bit rich that for just a day and I'll easily exceed the mileage in just collecting the car and driving it home but really want to spend 24hr with all three on road really. Other options is maybe hire an R8 V10 Plus gen2 for 24 or even 48hr as it cost far less than Huracan to do so. 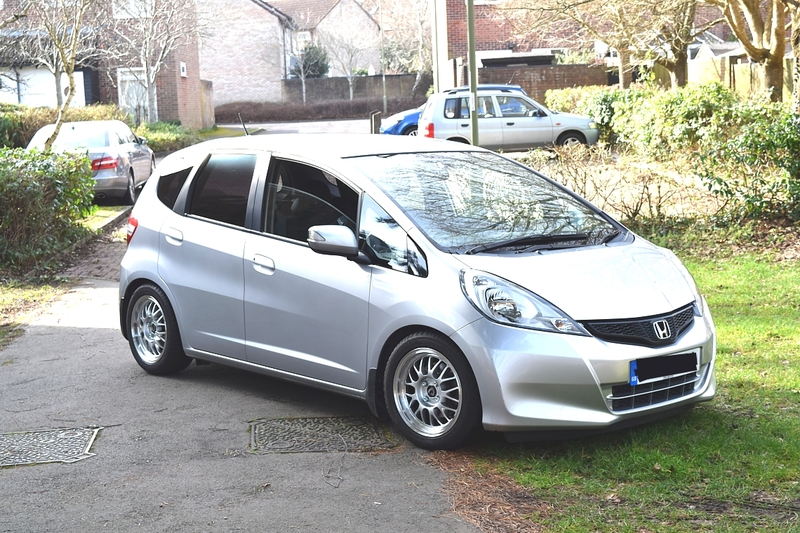 the Jazz looks really good, but he's still messing around with the tracking and ride height so i cant collect it until monday. It'll then need the body work sorting out and respraying, so about another 1k, it's amazing how different it looks, it looks nothing like it did before. Surely it’s just not worth the effort or cash. the only hassle is the bodywork but once it's done it's done, i would definitely do it again because it looks so much better than the standard car. i got her back today but she's too low, she's rubbing on the arches so they're raising her 1/2 an inch and i'll get her back tomorrow, she handles far better, it's like another car and she corners very well too, no body roll, the suspension feels fine about he same as before but much more planted. Can't make my mind up on replacing the R8. Raleigh Vektar or Sinclair C5! Not something i'd pay a premium for let alone join a waiting list! If you're buying it simply because you like the looks, that's fine. If you want something with a modicum of off-road capability and decent on-road manners (or you just want more traction on good roads, which the Jimny doesn't offer), then there are significantly better and more affordable options out there. Ignis or Panda 4x4, for example. It reminds me of driving a Defender and feels like a polar opposite of my Fiesta. It won't replace the Fiesta. I like the styling and tech that it offers and around Cornwall it's a riot to drive one. Partly to do with its looks but it's so different to my Fiesta. It tackles Cornish roads without a problem and it's refreshing to not wince at every bump in the road. I do like the Ignis but it doesn't fill me with the same joy as the little Jimny does. I've taken one out twice now and it 's just hilarious every time. I like the unrefined engine tone. I like the interior. It reminds me of a Defender without the price tag and more tech. It's most likely a fleeting fancy but I do find them enjoyable. I had an old Jimny in Crete. Absolutely loved it. Like you say i'd love a Jeep Wrangler for similar looks but they're far more expensive. Will probably look at replacing the M140 later in the year for something with more room in the back for 2 dogs. Eyeing up a 3 series touring or something from VAG. Recently started speaking with a dealer who is on the lookout for Mini GPs. They seem interested in mine. Problem is, I've started to question whether I really want to sell it. I've just put so much time an money into the thing that 50% of me wants to keep it. Whereas the other 50 wants to sell and move on. I really dont know what I'm going to do now.